The Grand Pacific Hotel sits on Mountjoy Parade/the Great Ocean Road near the pier on the edge of Lorne. The Victorian building is impressive, we sat outside, but a trip in to the bar showed it looked good inside too, with a tasteful refurbishment. The menu covered a range seafood, steaks, pizzas and pub favourites. We shared the "Pacific Seafood Platter For Two"
The crystal bay king prawns were good as was the spiced calamari and chilli & tomato black mussels a combination I hadn't tried before. The battered coral trout was a slightly naughty treat, and worth breaking the no batter rule for, the grilled option wasn't bad either. The coffin bay oysters were well presented and enjoyable. The blue swimmer crab and marinated morton bay bugs were fine without being highlights for me, the fresh garden salad accompanied the dish well and kept me from having to many chips! 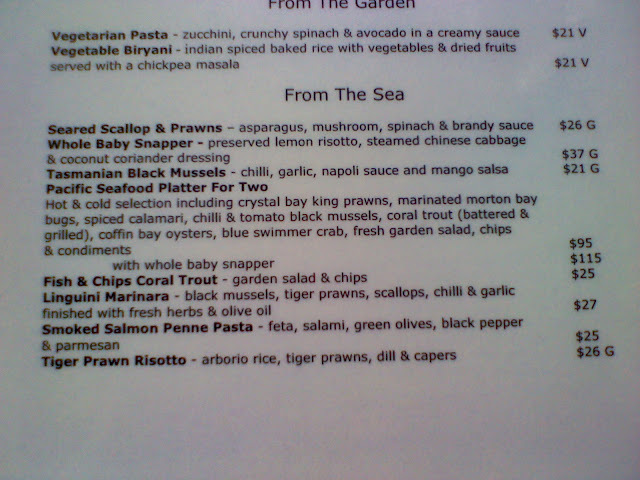 The platter looked as well as tasted good, and in a great location overlooking the sea was probably worth the $95.